You love skydiving. You want to share it with the people in your life you love the most. In your case, the person in your life you love the most just happens to be… your grandma. But – is there a maximum skydiving age limit? Can you take her skydiving? Or rather – can she join you in learning to skydive? Is skydiving really a young person’s sport? What is the upper age limit for a person to start skydiving? 80? 90? If you think that skydiving is an activity that only the young and unwise partake in, you have another think coming. As a matter of fact, nothing could be further from the truth. 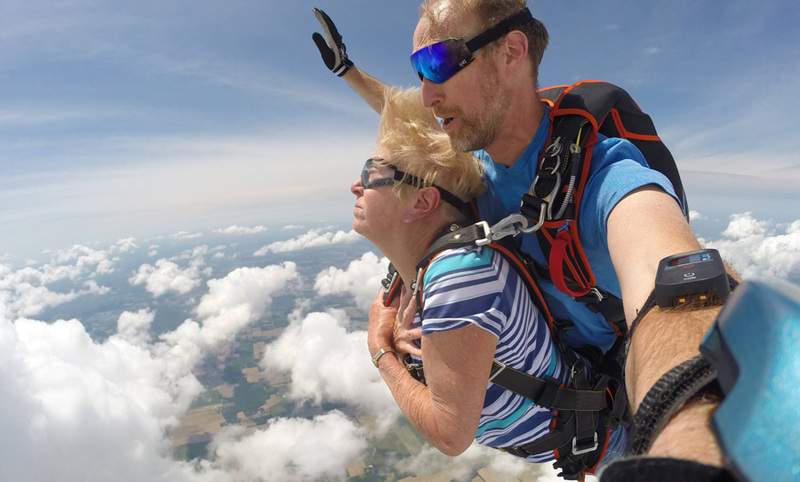 There is no upper age limit to make a skydive! 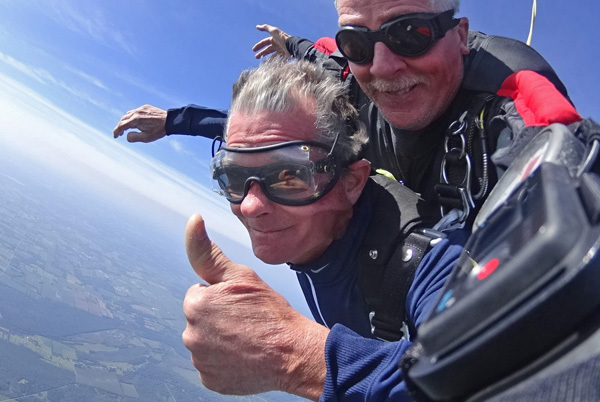 There’s no tandem skydiving age limit because there’s no age limit for feeling adventurous – and there’s no sport skydiving age limit, because people are awesome. Not only do folks over 90 (and 100!) regularly make successful tandem skydives, there’s a huge community of sport skydivers well into their silver years. There’s even a club for parachutists over ninety! They have competitions and set world records. Go figure. What are some of the considerations for a person over a certain age to make their first tandem jump? For obvious reasons, it’s important that skydivers of any age be healthy in an overall sense. (Example: oxygen tanks can’t go on board a plane.) For older skydivers, there are two things to consider: basic functional strength and cardiac health. Don’t worry: The “strength” thing isn’t about bicep curls or leg presses. It’s about ensuring that the jumper has enough strength to lift his or her legs up for a safe landing and respond to the simple movement direction given by the instructor. An assessment is easily conducted in person, on the ground. If grandma (or grandpa) has been diagnosed with high blood pressure, there are some things to think about. Nervous anxiety, paired up with the lower level of oxygen (and the air pressure changes that occur on every skydive), can pose a serious problem. Even if you’re on prescription medication for your hypertension and your doctor considers it controlled, you should still check with your doctor before doing a tandem skydive. What risks are amplified if you wait to start the sport until a certain age? The most common injuries in skydiving are to the extremities: specifically, rolled ankles and sprained wrists (from arms and legs thrown out in an ill-considered self-protective gesture). That said: done in the carefully variable-managed environment of a responsible dropzone, skydiving is a surprisingly gentle pursuit. What is the maximum age for someone to start AFF training? There’s no USPA mandate for the maximum age a person can undertake a solo skydiving licensing program. That decision is left up to the Safety & Training personnel at the dropzone, as it’s very important for each case to be evaluated individually. Likely, a potential sport skydiver of advanced age will be asked to present a medical evaluation. 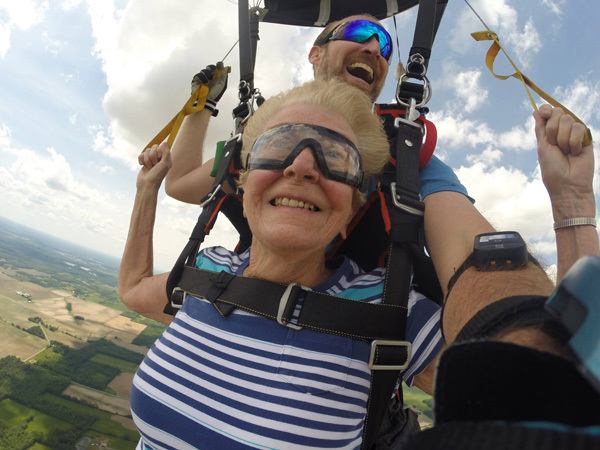 So: when you’re on the dropzone and you see an older person skydiving – especially when you’re on the ground – you’d do well to remember this: the limits are what you make of them. It’s up to you to break through. WNY Skydiving welcomes skydivers of all ages (though you have to be at least 18). So come on down to the dropzone, and don’t be afraid to bring your darling grandma or grandpa. We look forward to teaching them how to fly.